Time for our CASE with your own twist challenge (copy and share everything) at Time Out Challenges. This time we are so very happy that we have the chance to CASE the very talented Julia Alterman. I am sure many of you know Julia and know how so very talented Julia is. If not take a visit to her blog Just One More Card. I guarantee you will come back inspired. Here is my CASE of Julia's card. Not being very good at colouring I looked for other things in Julia's card that inspired me. I picked out the use of her frames, the blue and yellow colours and the sequins. I really liked how this turned out and got to use my new STAMPlorations dies-the outer frame and the 'hello' die. The centre frame is popped up for dimension. 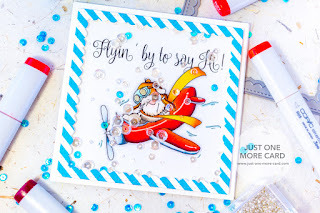 Our Guest Designer for this challenge is my fellow teamie at AAA cards, Jenny. I am always inspired by her cards and so pleased she is joining us for this challenge. Her blog Craftmosh is a delight to visit-pop on over there and enjoy. Your card is really beautiful, Sandie! The colors are fantastic! Love how you put the frame inside the frame. So cool! Great card -- love how you picked out alternative things to CASE! I love that you paid attention to his yellow scarf, Sandie - LOve your frames! Julia's card is wonderful but your card is too! Love your double frame and popped up center frame with text! Sandie this is just perfect! Love the big yellow hello and frame! Lovely card Sandie! I love all the yellow with that little touch of blue! This is what I love about case challenges. You can pick inspiration from a designer or card that has a different style than your own and you can turn it into your own style. I actually think we unconsciously are casing more often than we think we do. I love visiting others blogs and I'm sure I pick ideas from both here and there... I think your card looks really cheerful in these colors. Your card is such a ray of sunshine Sandie - I love the yellow and white colour combo - and the double frames are a genius CASE! Love it! Love how you've been inspired - that bright yellow frame is just gorgeous ..what a perfect fit for the sentiment! I love the colors you chose for this card Sandie - so fresh and bright. The pop of blue from that one blue sequin is a touch of genius to case the blue on the card. Thank you very much for the lovely words, I had a blast guest designing.